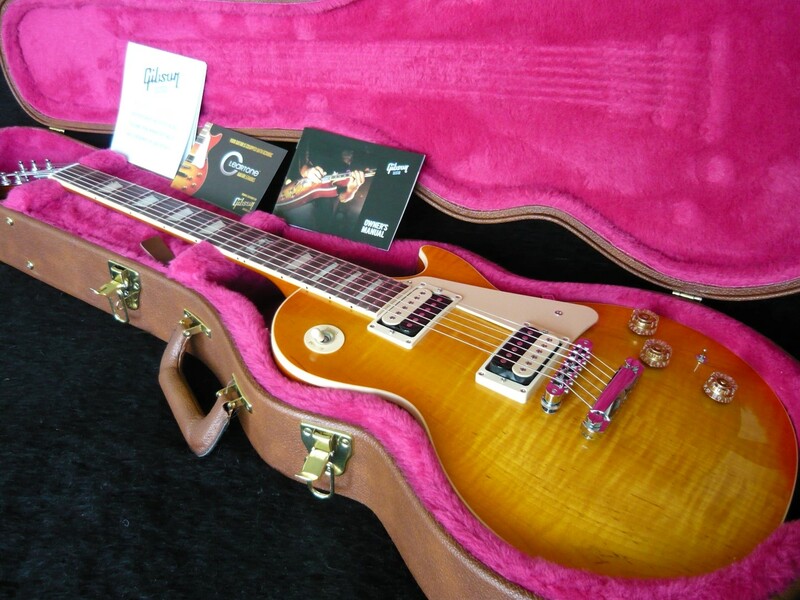 Brand new 2014 Gibson Les Paul Classic - Lemonburst. Comes with everything it comes with from the factory. 100% mint. Genuine Made in USA. Gibson 120th Anniversary engraved on the 12th fret. The value of the features on this brand new 2014 Les Paul Classic is outstanding. Believe me, this is an awesome axe. Ever been at a gig and you come to your solo, you turn your guitar up full bore and the tank still comes up empty. The 15DB boost switch really cranks it up. With Zebra coil '57 Classic and hot Super '57s sweetened up with coil splits. The mahogany body has the Swiss Cheese traditional weight relief. So you are getting the features of a Les Paul Standard without the chambered weight relief of the Standard. All for $1000 less in price. It has the 60s rounded neck. So easy to play, beautiful and comfortable just a breeze. The frets are undercut over top of the binding for speedy, precise action. Grip deluxe on the volume and tone knobs providing precision maximum grip and control. Tuning accuracy with vintage tonepros keys, resonance and sustain with tune-o-matic bridge and stopbar tailpiece.